Observed along Oak Creek Canyon near Page Springs, Yavapai Co., Arizona, USA. August 2011. Note the ashy white abdomen. When very fresh from molting into adult the male's abdomen is yellow with a brown stripe. 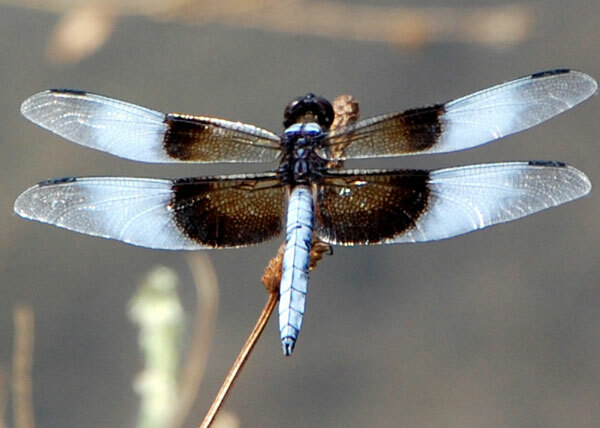 Dragonflies are a marvel to watch and study. They are common near ponds and streams where there are shade trees and refreshing water. The immature stages inhabit shallow ponds and lakes where they are predators of aquatic invertebrates. The adults eat mosquitoes and other mostly soft-bodied flying insects. Close range binoculars are a great aid in observing and identifying dragonflies.